Much as if he were E.F. Hutton, people in the golf world fall silent and listen when Pete Dye speaks, as he did last month at Bulle Rock. To begin the program, Bulle Rock's General Manager, Rick Rounsaville, gave a comprehensive talk on the history of the property and golf course, and owner Ed Abel Jr. spoke on his motivations for embarking on the project -- one that's led to numerous awards and Golf Digest's designating Bulle Rock a 'Five Star' destination. That's a rare honor, indeed, since the list of 'Five Star' facilities includes courses like Pinehurst #2 and Pebble Beach -- two courses having hosted US Open Championships. 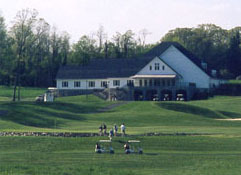 Bulle Rock's in grand company to say the least, and much of the credit goes to Pete Dye. 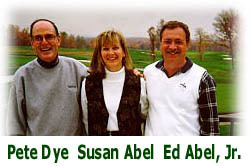 Q: Mr. Dye, you said that you 'did not undo God's work' at Bulle Rock. 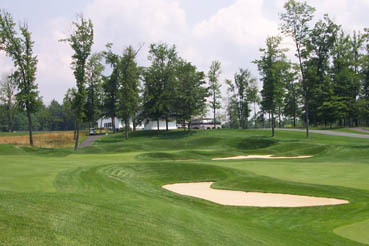 What would you say makes Bulle Rock special in today's course building environment? 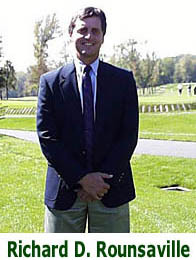 Dye: Well, in the old days, when you built a golf course, a guy would come to town and they'd give him a nice piece of ground to work with and not put a lot of restrictions on him, as far as allowing for houses, and apartments and so forth. So when I went out to Bulle Rock, and Mr. Abel told me I could work on all that ground with its wonderful movement, and didn't have to worry about putting condos in the middle of the doggone thing, that's a great feeling. The second golf course (Bulle Rock's second course is in the early construction stages) will be the same way, because it's isolated. You just get that feeling when you go out there -- that that Bulle Rock property is a big piece of land. I've always made the point using the 18th hole at Pebble Beach to illustrate. Everyone sees it on TV and thinks 'that's a nice par five,' but if you take away the Pacific Ocean, it's just a nice par five. Matter of fact, the next thing out of bounds is Japan, and that makes it a super par five. So when you get back in there at Bulle Rock, and you come up along some of those places like on 12 and 13, you're isolated. How many places in this country can you go anymore and play golf where you're completely isolated like that? That's a great part of the game at Bulle Rock. Q: You mentioned the second course at Bulle Rock. What's it going to be like? Dye: You'll get that same kind of isolated feeling, but the course sits higher, and you'll have more vistas of the Chesapeake Bay -- there are longer views up there. I think, when you're playing a nice par four in a wooded area, with trees all around the teeing area and down the fairway, that's a nice experience. But when you get beyond the green, and there isn't anything for 20 miles -- and you don't see anything but woods and water, why that's a lot better. The setting really adds to the golf hole. Mr. Abel's got some ambiance, some views there that are just unbelievable, and that's exciting. And we put these Bulle Rock golf courses into those corridors that emphasize the views of the Bay, along with all the other great things on that property. So when you're standing there, it's like 'why should I play golf, I think I'll just stand here and look,'--just one of those kinds of things. Q: Sounds great, I can't wait to see it. Now, when you build a course like Bulle Rock, do you take into account the types of course conditions you're going to have there? The rough was incredibly lush -- and it really was a penalty to hit it in the thick stuff. Dye: Of course. But you've also got to realize that they'd had an awful lot of rain just prior to your seeing it. That bluegrass rough is just like wire when it gets thick. But if you go back after it's dried out some, it'll ease up. And I know with the Superintendent they've got there (William Lewis), he'll make sure that place is in tip-top shape. Lewis told me they've been running ragged trying to stay ahead of it -- that as soon as they'd cut it, the next day it'd grown back. I hate rough when it gets that thick. But the nice thing is it doesn't stay that way. You certainly account for course conditions when you're building a course. But you've just got to try and keep ahead of it, that's all. Q: Regarding your overall course design philosophies, do you go into a site thinking you'd like to achieve a certain look? Dye: Most people say my fairways are too wide -- even the pros say it, that I give folks too much room off the tee. But I don't think there's any such thing as too much room. The object is to get 'em started, so I give 'em a lot of room. Around the greens, that's a different story. Not everyone can hit the ball 300 yards off the tee, but you can hit any kind of shot any other mortal sinner has hit in the past around the green. You may not be happy with these deep bunkers or these little shots, and you may not be able to do it as often as Phil Mickelson -- but every once in a while, you're gonna pull it off. Physically, you can do it. Women too. So around the greens, I'm liable to put anything, because I feel even the lady player can physically get one shot, maybe one out of twenty, or one out of ten, or one out of five. She's at least got the ability to do it. But she can't hit the ball 300 yards off the tee. Those are my thoughts on it. Q: You mentioned during your talk that you weren't an architect, and you don't work from a set of plans. How does that work? Dye: (Laughs). Well, a lot of my architect friends like Mr. Nicklaus and Mr. Fazio rely quite a bit on plans, and with the computer equipment they've got these days, they're very precise. Looking at some of the courses they've turned out, it's obviously a tremendous way to do things. I like to do it a little differently. I'll certainly get a topographical map and sketch out a 'pencil drawing' of where the golf course is going to be on the ground. Then I'll make arrangements with the owner to hire a local contractor to build it, and also a golf course superintendent and a crew. It's kind of an in-house operation, because the owner runs the payroll and buys all the materials directly. And of course, I work on a flat fee. Then we go out and build the golf course. When it's cleared, we'll walk down the holes, and I'll plan it visually. I used to know how to work all the equipment, but now I'll just tell the crew what I want. Once you get the holes routed, you've got a pretty good idea of where you're going to run the entire course. You know the boundaries, and you might vary the first hole 50 feet to the left or make it 390 yards instead of 410 or 20, and you can do that without any additional cost to the owner. Then you'll get with the guys who run the bulldozers, and I'll explain what type of green that I want to build -- there's an area that we stake out, and I'll say whether I want to keep it open in front or to either side, and where the bunkers go, and how much to vary the slope, such as flowing the green nine or ten inches from back to front. After a while, we'll go back and take a look at what's been done. This way we can get several holes roughed in quickly. And a lot of times, what these guys have done, either with the green or the bunkering, is so much better than I ever envisioned. Maybe the next time we come back I'll say 'We've got three or four looking too much alike and playing the same way -- and we're trying to make this or that hole play a little different.' It allows us to make cost-effective changes, too. If he's got a D-5 bulldozer that costs $100 an hour to run -- and maybe in five hours time, he's rearranged it. That's $500. I maintain, I can do that four times, and that's still only $2000 per green. Multiply that by 18 and that's $36,000 -- which on a $5 million dollar project, is an incredibly small amount. So instead of having a bunch of stakes every 15 feet to mark out every little detail, they can get in there and do it faster the first time. That's what I do. Q: So there's an awful lot of 'hands on' time then? Dye: Yeah, but the last thing a guy wants when he's working on a green is for me to stand there watching him! I'll come in there and we'll go over three or four greens, and it'll take him a day and a half or two days to a green -- and he wants me to get the hell out of there, you know? Most of the superintendents would rather have me come in there on a Sunday, when no one's working, rather than have me standing there while someone's trying to get something done. Q: You mentioned that you thought a lot of courses are over-treed these days. Why is that? Dye: I think, like at Bulle Rock, where you've got trees on the boundaries that define the golf course, you don't need so many inside. It's just the way the course looks. 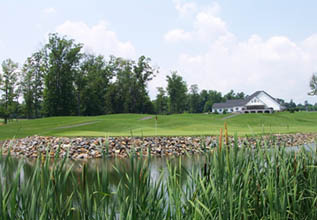 At Bulle Rock, you can see quite a bit of the property from most of the holes. I like that. Q: How is the new golf equipment affecting the way you build golf courses these days? Dye: Of course I would love to see the equipment stay the same for us mortal sinners to play the game of golf. But I think the scientists and aerodynamic folks have gotten so far advanced that they're going to have to do something in the professional arena to restrict 'em. Professionals are great players, and they certainly don't need the help. And the average player is the one who ends up paying for these new advances, because you've got to keep building bigger and bigger golf courses to keep ahead of these professional guys. It gets crazy. The cost keeps escalating, and escalating and escalating, and it doesn't do anybody any good. Really, if you want to Tiger-proof a golf course, make him play Harbourtown (Hilton Head Island, South Carolina) at 6400 yards. Then you'll have a screwy game where you're standing there with a five-iron on every tee. That's no fun. At the same time, I think these new clubs and golf balls for your average amateur player -- they're great. I'm talking about your 85-90 shooter. It's wonderful for the game of golf, and golf needs the help. Golf is plenty damn hard for us as it is. Q: Arnold Palmer says a lot of the same things -- let the average player keep the 'souped up' stuff, but increase the size of the ball slightly and make it lighter for pros. Do you have any thoughts on that? Dye: I don't want any changes for us. It seems like when they talk about it, they never mention having two sets of rules -- one for us, and one for the professionals. For the pros, they have to say 'this is the one they're going to play in golf tournaments.' Then Titleist, Wilson, and all the others can make the same ball -- for professional tournament play. When you walk in a golf shop, there're 60 different balls in there right now. We (meaning the non-professional) should be able to buy any of those 60 we want. But the professional has to use the 61st ball. We can buy that one too, if we want to, but the pros can't use ours. That's where I'm coming from. 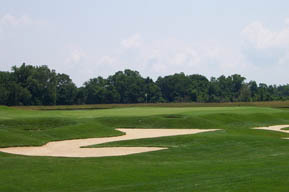 We're fortunate indeed to have Pete Dye's work at Bulle Rock and several other excellent golf courses in the region. To name just a few, there's the River Course at Kingsmill, TPC Virginia Beach, Harbourtowne Resort (St. Michaels along the eastern shore), and Rum Pointe (with his son, P.B. Dye) that bears his signature. As you can probably gather, Dye's an interesting man as well as legendary golf course designer. 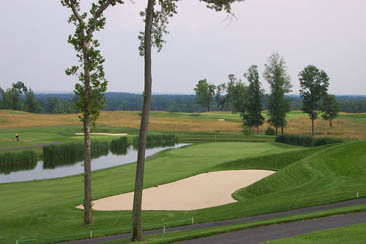 We can all look forward to playing Bulle Rock's second Dye designed course, hopefully by the spring of 2004. With Dye's considerable imagination going into it, no doubt, it'll be a sight to see. Tuesday-Sunday, $145. Closed Mondays. Rates include cart. Caddies are available, call in advance to reserve.